Conscious hosts create places that care simply because the people at each place (be it a B& B, a boutique hotel, the site of an activity, tour or event) genuinely CARE about their guest, the environment on which they depend and each other. They also care about the vitality of the local economy; the culture of the host community, the viability and responsibility of suppliers, and the needs of shareholders to see a return on their investment. When all these needs are met and, none at the cost of another stakeholder, profit flows. The evidence of the soundness of such an approach is becoming indisputable and is coming from a variety of sources. Those businesses operating with a culture of care for all stakeholders outperform those with a focus primarily on shareholders as discussed in the book Firms of Endearment. Since the act of providing “hospitality” and “re-creation” is also essentially an act of caring, we should assume that those companies, which are overtly engaged in the business of extending hospitality, could and should be pioneers of a more conscious way of looking after all stakeholders. One goal of the Conscious.Travel movement will simply be to identify hoteliers who do really care in this way and bring them together. 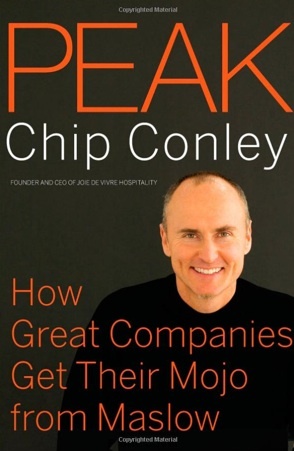 As far as applying the term conscious is concerned, two hotel companies have already “staked their turf” in this regard: Kimpton Hotels and the small but perhaps better known Joie de Vivre group of boutique hotels, operated by Chip Conley who has become a leadership guru in his own right and poster child for the Conscious Capitalist movement – see his book called Peak – How Great Companies Get Their Mojo From Maslow and website of his consulting and training organisation. the encounter between guest and host occurs at a unique point in time and place and is uniquely shaped by each – i.e., the more an experience is infused with a “sense of place and occasion” the more value and meaning it will generate for the participants. An earlier recession that occurred at the start of his career as a hotelier necessitated an innovative way of surviving. Chip Conley was prompted to draw on his college education by bringing Maslow’s heirarchy of needs to the business world and making theoretical psychology practical and uplifting for thousands. First he applied Maslow’s heirarchy to the three kinds of people involved in his hotel: employees, investors and guests suggesting that each could aspire to more. Employees might start out wanting a job and the security that came with a paycheck but then graduated to wanting a career and finally a calling, a vocation or sense of purpose. Similarly, guests might be happy under some circumstances to have just a comfortable bed, but once they were assured of that would ascend Maslow’s pyramid and want more, finally seeking a boutique property that reflected their own values and tastes. Investors also want more than a financial return – many want to enjoy a sense of pride or create a legacy. 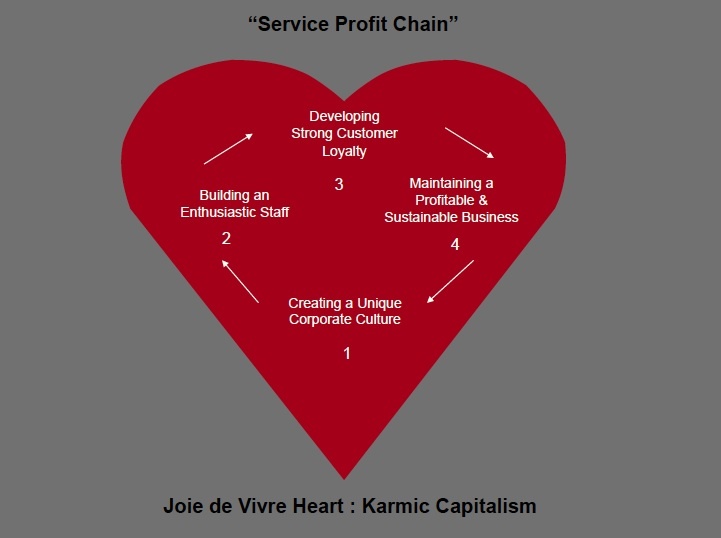 Conley’s genius was that he also took a long hard look at what he called the “Service Profit Chain” before combing both approaches into a powerful model designed to deliver maximum value to all stakeholders. The following slide presentation – sourced from www.rypple.com – illustrates Chip Conley’s thinking. The Kimpton Hotel Group may not have approached the act of becoming conscious hoteliers quite as methodically as Conley but have placed similar emphasis on employee care and ensuring their employees find fulfillment in their work. Michael Dapatie, CEO of the Kimpton group, says that one of his jobs is to help his 7000 employees “connect with themselves”. Caring for his employees creates a “chain of caring” that runs down throughout the organization and makes a stay at one of Kimpton’s boutique hotels a “transformative experience” for customers. “If you grow the people you’ll grow the organization” says Dapatie. Employees at Kimpton are surveyed to help determine their strengths and weaknesses, and “personality style”. By allowing employees to pursue their passions and interests within the framework of their jobs, the “caring” is expressed in loyalty to the company, an uncommon and highly acclaimed experience for the customer, and an organic, employee-driven effort to embrace core tenets of conscious capitalism: social responsibility, sustainability and environmental awareness. “a responsibility to positively impact the communities in which we live. We strive to be conscious of our impact on the environment and to make a difference where we can. We strive to help and provide leadership for those around us, both inside and outside our company and our industry. Ultimately, we believe that when we are more successful in our business endeavours, we have more resources to make a positive difference in our communities”. 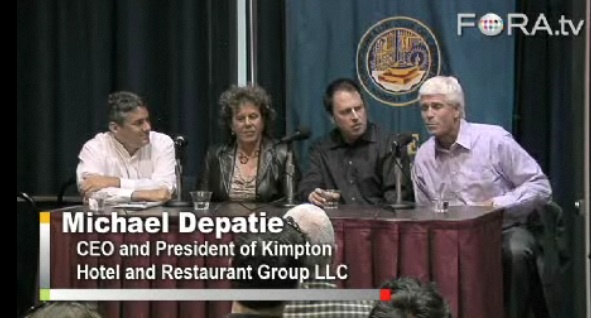 Depatie provides further insights into Kimpton’s approach in a 3 minute video accessible by clicking here.